It is one week into the grand experiment of colonisation and things are not going well at Nepean Bay. Samuel Stephens and Captains Morgan and Ross have their hands full, with both the company men and the crews of both ships ‘very troublesome, impertinent, idle and dissatisfied’ in Stephens’ words. The unloading is going slowly and Stephens has hardly a good word to say for anybody, except Henry Wallan, whom he describes as ‘really a worthy fellow’. Some of the Island’s other inhabitants are making their presence felt as well and Stephens is beset on all sides. ‘The Rats, Ants, and divers other rational and irrational beings are being very troublesome’ he confides to his diary. Quarrelling and drunkenness amongst both crews and company employees is getting out of hand. Mind you, tempers may not have been improved by Stephens‘ habit of rousing everyone at 5.45 am, in the cold darkness of a July morning, with a rousing ‘morning call’ on his trumpet, especially if most of the men were nursing hefty hangovers from carousing the night before! 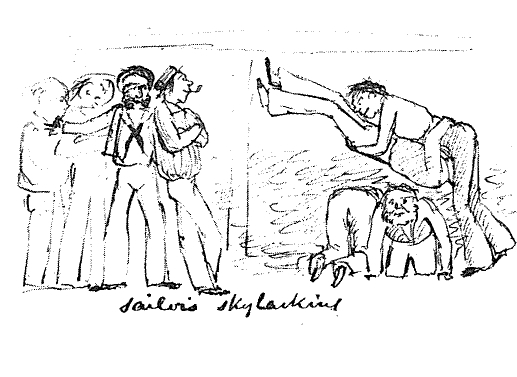 Sailors skylarking by Edward Snell, 1849. Things come to a head on the night of 13 August. The crews have had a day off for ‘a ramble’, but seem, instead, to have purloined enough rum to get themselves thoroughly drunk and belligerent. Attempts to get them back on board fail and things continue to degenerate, with ‘quarrelling, fighting, and obscene and blasphemous and threatening language’, culminating in threats to raid the company stores for yet more rum. Stephens can find only two men he can trust, but he arms them and himself and mounts guard on the stores until 7 am the following morning, ‘being the whole time in momentary expectation, spite of my efforts to prevent it, of being compelled to fire upon the poor depraved and deluded beings by which I was surrounded.’ With the dawn comes peace, or perhaps just exhaustion. It has been quite an eventful first week! It seems that discord amongst the passengers is plaguing all of the ships this week. The Tam O’Shanter has a problem with petty theft, while on board the Cygnet Finniss and Kingston continue to disagree on just about everything. As arguments amongst the men spill over into violence, Finniss blames the demon drink, but hints darkly that the behaviour of the cabin passengers is little better. On the Africaine the rum ration is also causing problems. The Gougers‘ servant Margaret Clarke is reprimanded for ‘Probably flirting. lightness of conduct towards the sailors ‘, and soon afterwards exhibits alarming symptoms of mental disturbance. But in the end it seems that she is merely drunk. Like many of the other female emigrants, the daily rum ration is more than she is used to. Robert Gouger and the captain decide to withdraw the rum ration from the women and children, a decision that is very unpopular at first. But Gouger is convinced that ‘poor people’ should not be served ‘spiritous liquors’ at sea. It makes them lazy and fractious. Gentlemen, he implies, can manage their drink. We should hope so, because they seem to consume an awful lot of it! On the Buffalo the trials seem to be of a lesser nature. George Stevenson endures the ‘punishment’ of a musical evening, provided with the assistance of an ‘indifferent piano’. He notes that the ladies are gradually becoming more reconciled to the inconveniences of shipboard life, but adds the patronizing comment that ‘it does require some physical strength as well as moral courage to endure the annoyances inseparable from a sea voyage.’ The ‘ladies’, by implication, exhibit neither! 8th. Continued landing cargo and lengthened store and commenced digging the well, offered to hire the boat from the Islanders to attend on us but as they were exhorbitant in their charge declined it. Most of the men are very troublesome, impertinent, idle and dissatisfied and it is all but impossible to keep them in anything like working trim. Mr. Beare is entirely occupied in attending on his wife who is quite deranged. Mr. Birdseye is consuming unnecessary time in making for himself a needlessly comfortable temporary dwelling. Mr. Shrevogel I am obliged to leave on board the Duke of York for sundry purposes. I have to bear up against all, and struggle with all both mentally and physically. I thank God however I feel cool, collected, determined and happy and doubt not we shall get all in good humour and better order before long. I receive considerable assistance from the Islander Mr. Wallan, who is really a worthy fellow. read the 1st [?] chapt epist of St Peter. Captain Morgan landed before my store 28 (less 2 landed before) casks of Hamburgh Beef and Pork which he had brought in bond from London for this place. There is a good deal of quarrelling the ships and on shore and I have my hands full to overflowing! We continued to land and receive cargo as also private baggage for which I have erected a separate temporary store. The Rats, Ants and divers other rational and irrational beings are very troublesome. Rose at ¼ to 6a.m. and finding no hands stirring sounded my morning call on my trumpet which soon brought all out. Set the men to work in various ways. At 7a.m. a boat from the L.M.P. with Mr. Edmonds (3rd Mate) and 1 watch reached the shore the men having had that day allowed them a ramble. Mr. Edmonds thinking that I had heard something to the disparagement of his character wished and received a private audience and retired as he said (and as he ought to be) perfectly satisfied. I took this opportunity of urging upon him the necessity of his giving his utmost support to the Captain (against whom I hear no complaints except from Mr. Birdseye) and particularly for the sake of his own and brother officers’ characters endeavouring to his utmost to prevent the purloining by the crew of the ships small stores, more especially ardent spirits. He received my observations as they were meant and we parted pleasantly. … In the evening settled with the men (having previously allowed them to buy from Mr. Birdseye at the store 1 pint of rum per man for their next week’s consumption – on condition that if I found the same improperly used I would allow it no more) and soon afterwards learned that the sailors on liberty from the L.M.P. were not gone aboard but were carousing with some of my men. On learning this and that they had (as was generally supposed) brought rum ashore with them endeavoured by various means to get them on board without effect. In a short time afterwards the conduct of the party became so outrageous as to warrant the supposition that an attack was meditated upon the store with a view of possessing themselves of a further supply of spirits. Quarrelling, fighting and obscene and blasphemous discourse and threatening language having proceeded to an alarming height and I being able to obtain the assistance of only 2 men on whom I could depend I armed myself and them and mounted guard till 7a.m. on the following morning (Sunday) being during the whole time in momentary expectation, spite of my exertions to prevent it, of being compelled to fire upon the poor depraved and deluded beings by which I was surrounded. This day, being Sunday, and the weather being fine, though the wind was still contrary, we had Divine Service on deck. Three ships were seen in the distance, also two large birds, supposed to be the albatross. This I thought an extraordinary circumstance, as we were then three hundred miles from land, the nearest being the Gold Coast. Saturday, Augt 13. Light winds & fine. West. Close hauled. 3 Sail in sight. Noon. Do Wr. Miles run, 1110 + 76 = 1186. Late 35E33′ No. Longe 16E26′ W.
-pas on the wood: after scraping them off, it was hoisted in. P.M. Fine weather & light winds. Steering S.W. People very merry. Next week: There is more trouble with the ships crews at Nepean Bay, while on the Buffalo Young Bingham Hutchinson reflects on the implications of turning thirty. Then finally, after the longest voyage of any of the ships, the John Pirie arrives at Kangaroo Island. Image from The life and adventures of Edward Snell. The illustrated diary of an artist, engineer and adventurer in the Australian colonies 1849 to 1859. Edited and introduced by Tom Griffiths with assistance from Alan Platt. Courtesy of Angus and Robertson Publishers and the Library Council of Victoria, North Ryde, NSW, 1988. Ah, the things our school teachers never taught us in the 1940s about the South Australian First Fleet! 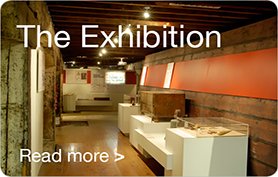 The demon rum was always confined to that rabble which landed at Port Jackson – mainly convicts and loose women! Having read the diaries and logs so far I am simply surprised firstly that the expedition to settle in South Australia ever reached these shores, and having done so, actually succeded in establishing a colony. We were always taught that the Buffalo arrived at Holdfast Bay, that there was a service at the Old Gum Tree, and that everyone lived happily ever after. Vive la difference! Many thanks, History SA. Marvellous stuff.